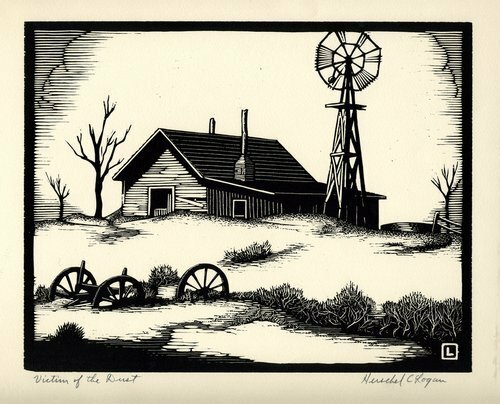 A black ink on rag paper woodcut showing a deserted farm house with dust piled against and around it. The artist described it as "a composite of several sketches of the Dust Bowl days. Victim of the Dust was drawn by Herschel C. Logan, who was born April 19, 1901 in Magnolia, Missouri, and shortly after his birth the family moved to Winfield, Kansas. He attended the Chicago Academy of Fine Arts for one year. Logan was a commercial and advertising artist in Salina, Kansas, until his retirement in 1968. He was a member of the Prairie Print Makers. After retirement, Logan moved to Santa Ana, California.